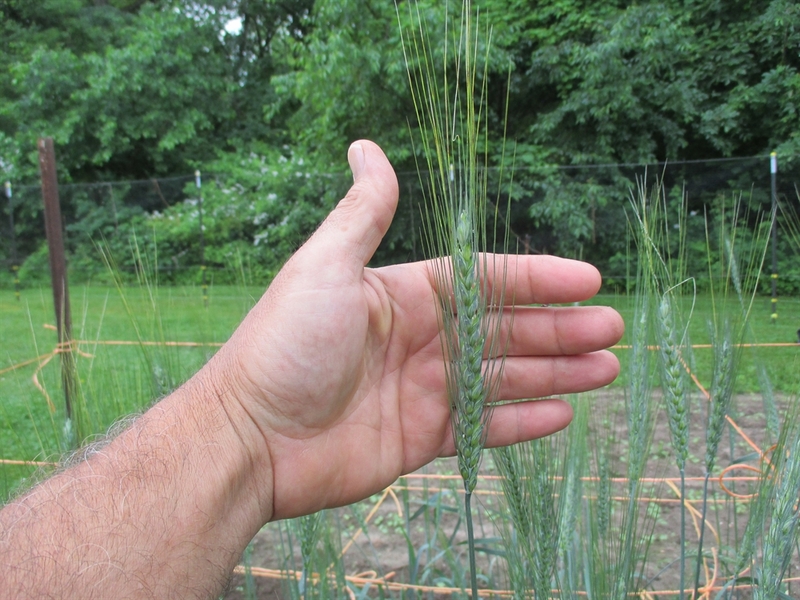 This is a hard red winter wheat with a unique, rich flavor and excellent baking qualities. Turkey Red is a heritage wheat brought to the US by Mennonite immigrants from Ukraine in the early 1870’s. At one time it was the primary wheat planted in the Central Plains. This season was my first experience growing this variety. We had an incredible amount of rain this last spring and early summer (2015). The Turkey Red had few issues with lodging, although it did show some signs of fusarium at harvest. I replanted again this fall and hope to continue selecting for disease resistance. I also received some grain from a farmer in Kentucky recently. I plan to trial out his selection next year and compare the two. You mentioned that Turkey Red was once the main wheat grown in the central plains. True. But what replaced it was it’s children. The early varieties with other names were simple selections from Turkey Red. Maybe a farmer who, back in those days hand harvested, noticed a shorter plant and grabbed it and stuck it in his pocket. He grew it out seperately and multiplied it. And being shorter, it had less lodging, so he put a name on it and sold it. Another farmer noticed a plant with purple straw and kept it seperate, multiplied it. That was the variety ‘Purple Straw”. Pure Turkey Red. Professional breeders made crosses of these “varieties”. Modern wheat in this area are still mostly Turkey Red by ancestory. They have lost most of the genetic diversity though. Thanks Walter. What you are describing is breeding by selection. This is the way wheat varieties have come down to us since the days of wild Emmer and Einkorn. I would like to plant this grain and had a question. Does it need additional fertilizer to grow and is it subject to and deceases? can be an issue if you have a lot of rain during flowering in the spring. Again, heathy soil and following a rotation will help with any disease. How tall did this variety grow in your area? Turkey Red grows to about 3 1/2 foot tall. Thanks. One more question. Do Banatka and Turkey Red come to maturity at the approximately the same time ? Very close maturity but in my experience the Banatka is about 1 – 2 weeks earlier. Banatka has always been the first winter wheat I harvest.